I am going to teach you step by step how you can make money online with just your smartphone and data bundles. So what exacly is blogging? Blog is very similar to a website. I would say that blog is a diary/journal that is (mostly) maintained by one person – blogger. Usually, blogs are being updated quite often (once a day, once a week, once a month). Blogs can be private, but most of them are available on the internet for others to see. Blogs have certain topics. Bloggers are usually passionate about a specific topic thus they’ll create one. It can be entertainment, music, news or celebrity gossip kind of blog etc. 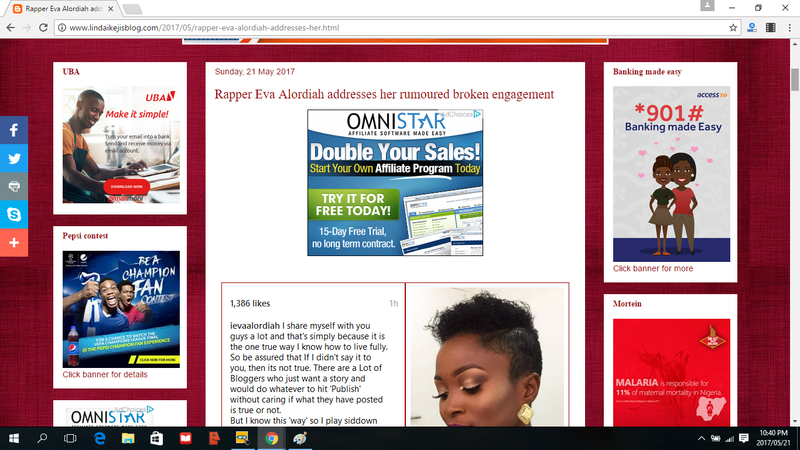 An example of a entertainment blog is Linda Ikeji's Blog https://www.lindaikejisblog.com/. You can google the famous blogger who makes millions just blogging on the blogger platform. So I am sure you might be asking yourself by now so how can you make money just by writing stories and blogging online. Well I am Sure every website I listed here and other blogs you might have bumped in to have something in common you should of have noticed on them.This is how they all make money by advertising. You might ask how much can these advertisements make? Its anywhere from R0 - countless millions. It depends on your website visitors. 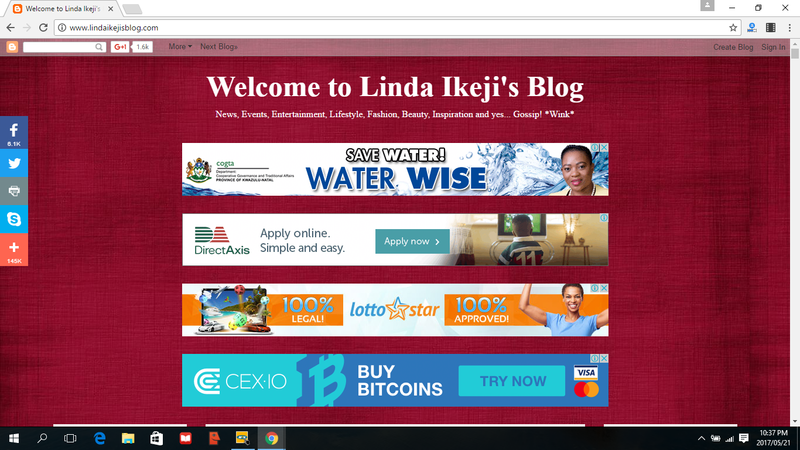 Bloggers like Linda Ikeji can make millions now and have been blogging since around 2006. Sounds like easy money? well lets try it together Il take you step by step to creating and setting up your blog in no time and hopefully you can start making money. First you need a blog which is your website and a domain name where people can browse it on the internet for example http://www.lindaikejisblog.com is a domain name you can get any extention you like .co.za .com, .mobi or .net etc. 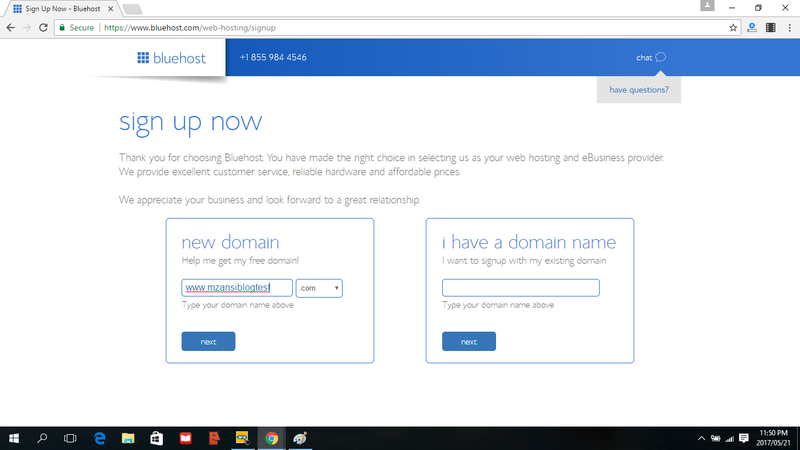 We have chosen to use Bluehost because it is user/newbie friendly you wont get any headaches from there. 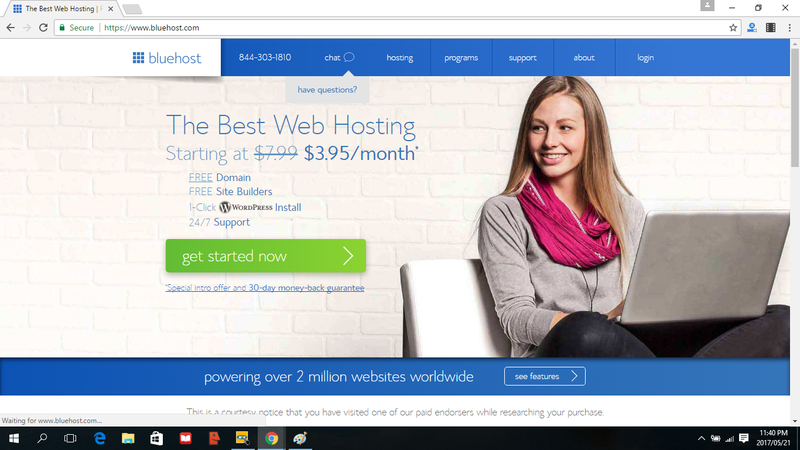 As a blogger you want a proffesional reliable company to host your website not a one that will make your website slow or offline now and then upsetting your blog readers in the process. 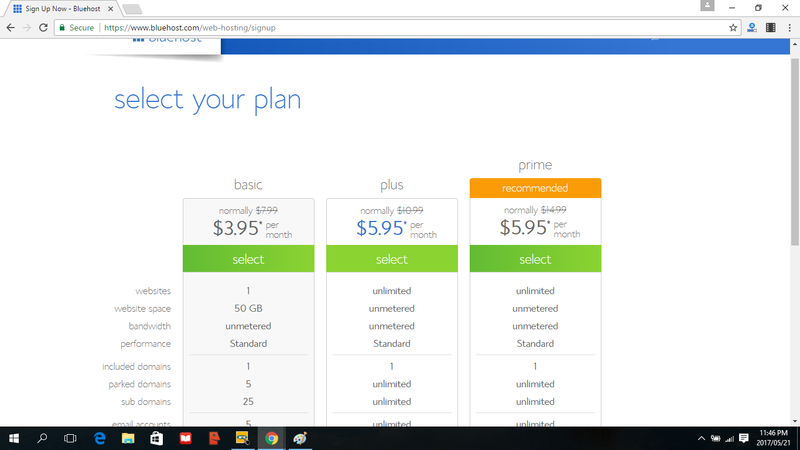 Step 2 : Select your plan I would suggest you take the cheapest at $3.95 equivalent to R52.28 rands a month. Go to and install wordpress software which you will be blogging with I expect this step to be fairly easy you will find your one click install button to add wordpress in your cpanel. After you have setup your blog and its online its time to start writing content and signup to an advertising network which will give you the ads to put in your blog. These ad networks connect publishers blog owners like you with advertisers. Ad networks charge advertisers for advertising on your blog and they pay you a commission. Depending on the ad network you in you receive a certain percentage of the ad sales. here is a list of well known ad networks and how much you can make with them. 1. 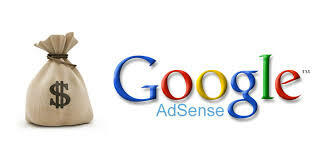 Google adsense - is an advertising placement service by Google. The program is designed for website publishers who want to display targeted text, video or image advertisements on website pages and earn money when site visitors view or click the ads.the revenue shared between you and Google is 68% for you and remaining is Google’s commission. 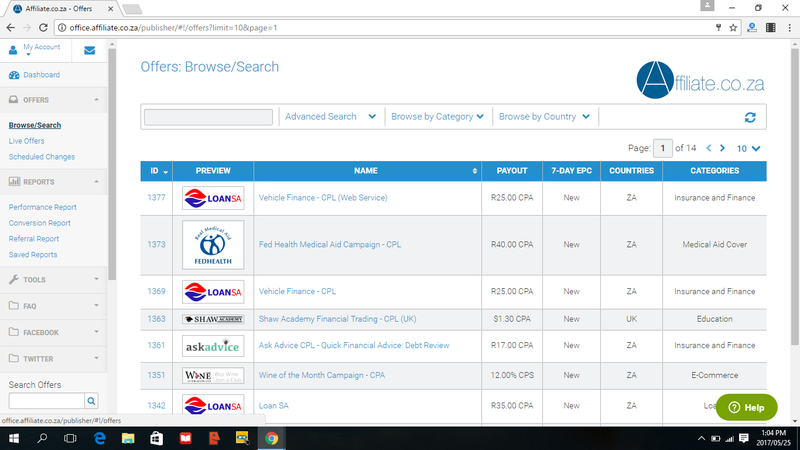 You need to at least make R1000 to get paid by Google adsense. Affiliate Network. 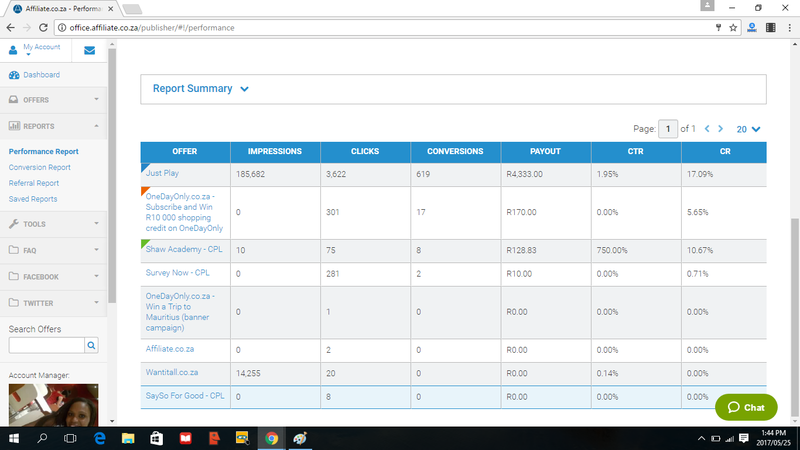 We believe that webmasters can generate more revenue by advertising local South African brands directly. Affiliate.co.za is an online affiliate network where Advertisers list their Online Offers and Affiliates / Publishers may earn greatest commissions by promoting the Offers online. 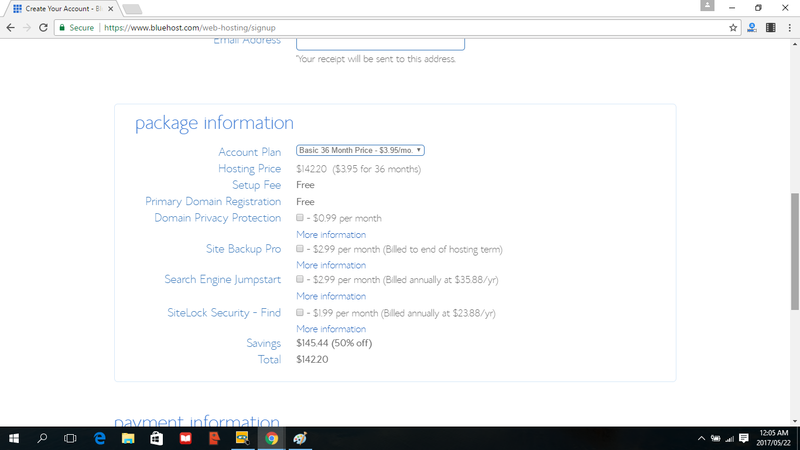 Affiliate.co.za issue NET15 payments for all affiliates. 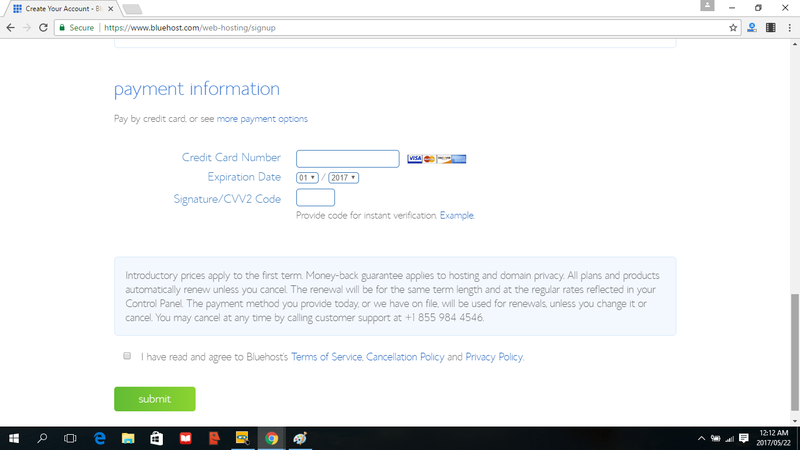 This means you should expect to receive your commission payment roughly 15 days from the end of each calendar month. 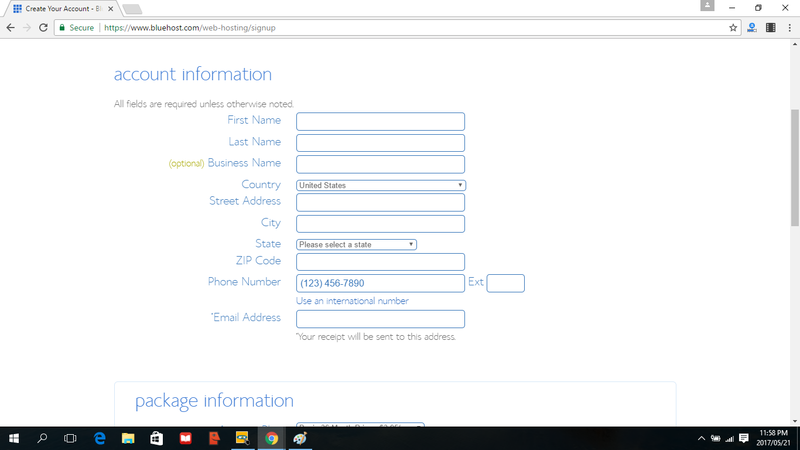 Please, make sure your banking details are registered in your account: "My Account" -> "Billing". Should you have a VAT/TAX Number, you may inter it in "My Account" -> "Account Details" -> "Company Details"
Payment threshold for SA affiliates is R250. Payment threshold for international affiliates can vary, please contact your AM (Account Manager) for further details. 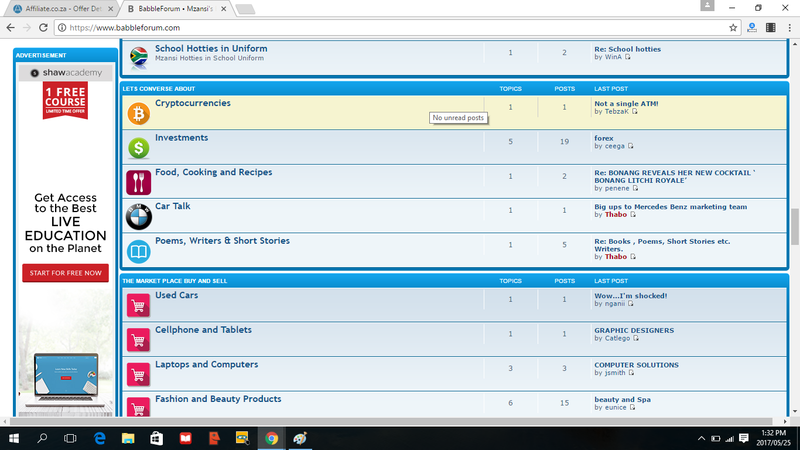 To start making money now on Affiliate.co.za CLICK HERE and Signup. 3. Offerforge - Our network was created to enable affiliate publishers to generate revenue by carrying advertising. We eat, sleep and drink affiliate marketing and are only truly successful when you are. Thousands of affiliates have trusted us since 2005 to independently track South African and international affiliate programmes. We're eager to work with you and grow your revenue. We're only too happy to meet with you, review your site and offer assistance in selecting offers to match your audience. We provide unique, handpicked advertisers as well as flexibility in choosing your linking methods, landing pages and offers. Whether your prefer display, pay per click, lead or acquisition-based payouts, you'll find a ready market of advertisers vying for your traffic. We support multiple currencies and payment methods and pay out every month. To start making money now on Offerforge CLICK HERE and Signup. Now that you have signed up for an ad network I suggest you signup with all of them for many opportunities. On the top left of the panel go and click on offers and it shows you a list of offers to promote and the payout amount you will payed if a user signups through you. I will promote on offer as an example i chose Shaw Academy for this example. 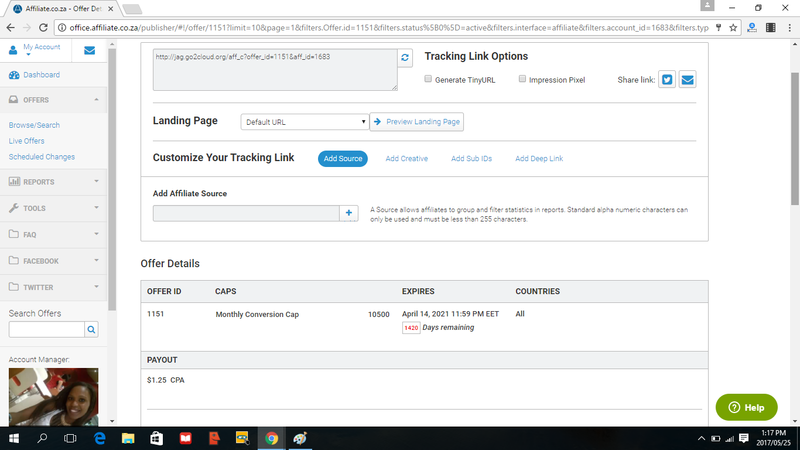 Find your unique tracking link to promote or if you want a html banner scroll down to creatives and click on get code. 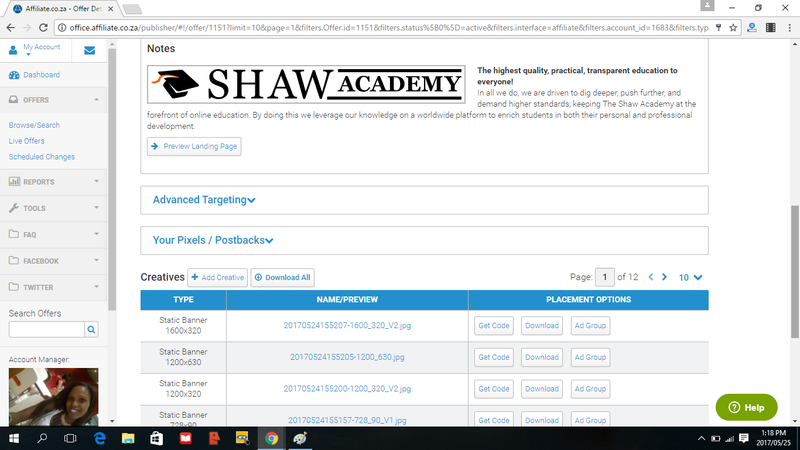 Copy and paste that link on your website and the Shaw Academy advert will display on your website like this. Now every time people click on your ad and sign up you get paid for it easy as that. You can track how much you have made by clicking on weekly performance report they will breakdown every thing for you and show you which offers made for you the most money in a week. The other ad networks are basically similar so you will find it easy to get the tracking codes from there. That looks easy time for you to do it.